RePEc is a uniquely organized initiative that brings with it an alphabet soup that confuses a lot of people, and we cannot blame them. Is a paper listed on IDEAS or RePEc? How is NEP different from RePEc? What is the difference between IDEAS and EconPapers? Etc. For starters, RePEc (Research Papers in Economics, hence the capitalization) is a way to organize the data about publications of all sorts in Economics, and make all that available. Note that there is no central database, as every contributing publishers makes the data available on its own website following the rules set by RePEc. Beyond those rules, RePEc only maintains the list of pointers to where the publishers have put their RePEc archives. Then, basically anybody can come and use that data. Some have decided to do that more formally and have their service listed in the repec.org domain. Examples would be EconPapers, IDEAS, and NEP. Others prefer not to or integrate the data in a larger scheme that spans more fields. Examples are Econlit, WorldCat, EBSCO, Google Scholar or ResearchGate. A third type of service uses part of RePEc data to enhance it and feed it back to RePEc. 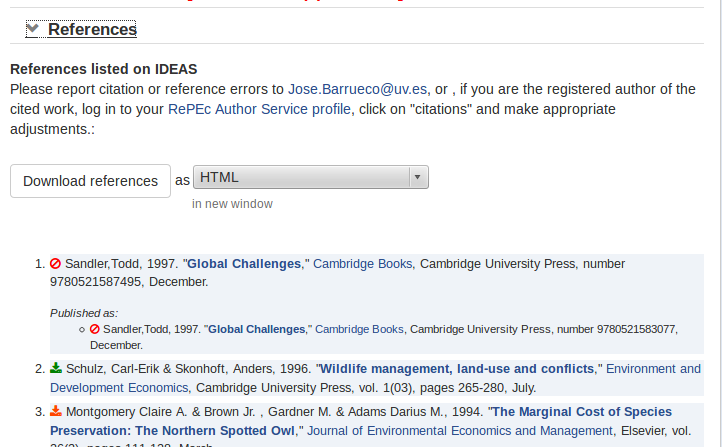 Examples for that are CitEc, EDIRC, and the RePEc Author Service. For a full list of the RePEc services that we know of, see the RePEc site. Thus, RePEc is the basis for these services, to varying degrees, but they are independently run and RePEc has no say how they should be run. In fact, RePEc is not even a formal organization. Thus IDEAS is using RePEc data just as EconPapers is using RePEc data, but they are in no way directed by RePEc. And, the big difference between IDEAS and EconPapers is that they were initiated by different people. In the spirit of healthy competition, use the one you prefer. Who is the typical RePEc user? This answer is not that easy to answer, as using RePEc services typically does not require any registration. Still, some services use Google Analytics, which provides some elementary statistics about users, but nothing about demographics. Below are some of what we can learn by looking at the Google Analytics for IDEAS for 2016. This may or may not apply to other RePEc services. First, one can learn a few things from the browser that is used. 53% of users have it set to use US-English, 8% British English, 4% each for Spanish and Chinese, and 3% each for French and German. This language variable, however, does not correlate perfectly with the location. Indeed, only 18% of users are in the United States, the next most frequent countries being the United Kingdom (7%), India (7%), Germany (4%), Italy, France, Canada, China (all 3%), and then with 2% Australia, the Philippines, Kenya, Colombia, Spain, the Netherlands, Japan, Turkey, Pakistan and Malaysia. This wide distribution is actually quite encouraging, as the goal of RePEc is to democratize the access to research, and getting “non-traditional” countries to adopt RePEc services this well is a good sign. In particular, Africa represents 9% of the traffic, South Asia 10%, Southeast Asia 7% and South America 6%. And yes, there is traffic from North Korea. What about browsers? Chrome is the clear winner, at 55%. Next come Firefox (14%), Safari (13%), Internet Explorer (8%), Opera Mini (3%) and Edge (2%). In terms of operating systems, Windows is first at 66% (of which 53% is Windows 7, 27% Windows 10, and 13% on Windows 8.1), then 14% on Macintosh, 10% Android, 6% iOS, and 1% Linux. It is clear from this that desktop use is still predominant (81%), while 16% use a mobile phone and only 3% a tablet. Where is traffic originating? Most of it comes from search engines (76%), while 15% of traffic is referred from another website. 8% of traffic is direct, meaning from bookmarks or by typing the URL in the browser. 1% is coming from social media. You are currently browsing the archives for the Use of RePEc data category.